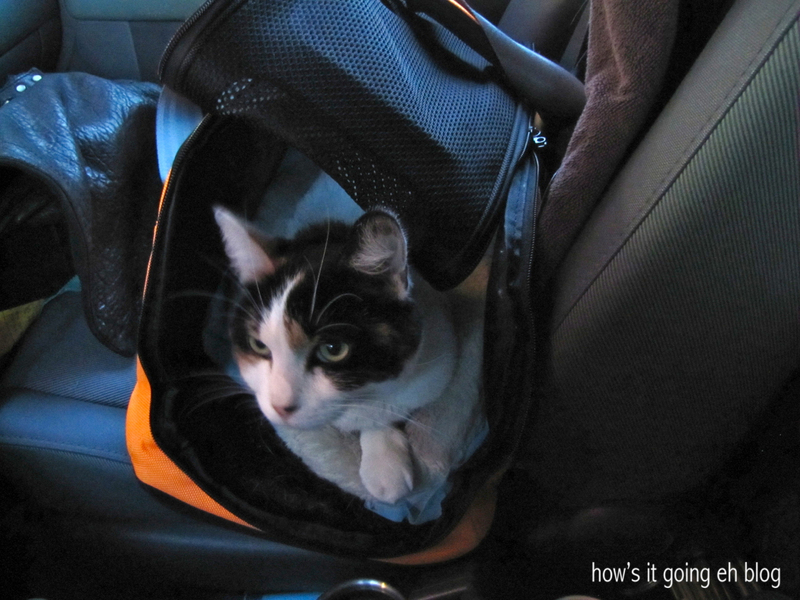 Road Trip with your Cat | how's it going, eh? Stuck in a car with a cat for hours on end. Sounds horrible doesn’t it? Well, here come some Tips Ahoy!!! Cats typically abhor car rides. 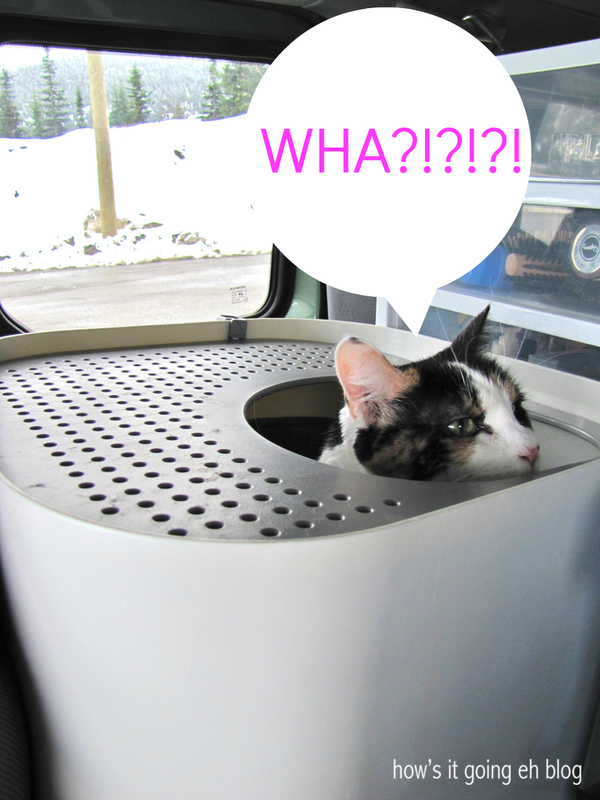 What the heck do you do with a cat when you have to drive further than your local vet office? Dogs have it Easy Street. Pop ’em in the carrier, pop ’em out + put ’em on a leash when it’s break time, yadda yadda. Whatever, dog owners. I had never done a road trip with Megumi before. And I was nervous about our first drive out from Vancouver to Alberta. 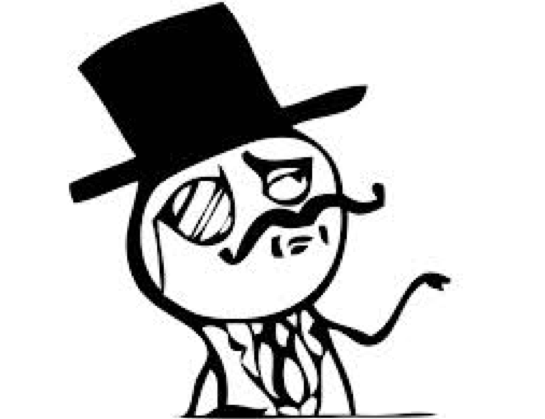 I neurotically read a bunch of articles online. Some of them were saying, “Step 1: put your cat in the car without the engine on for 2 days, Step 2: put your cat in the car with the engine on until they’re comfortable with it, Step 3: take short car trips with the cat, Step 4: Expand your daily trips. Do you know what I say to that?! Some websites said it’s ok for the cat to roam free in the car. NO SIR. That is an accident waiting to happen! You can get distracted, that cat may want to climb on your face – who knows! Get a carrier, you! A nice, soft carrier like my stellar Sleepy Pod. 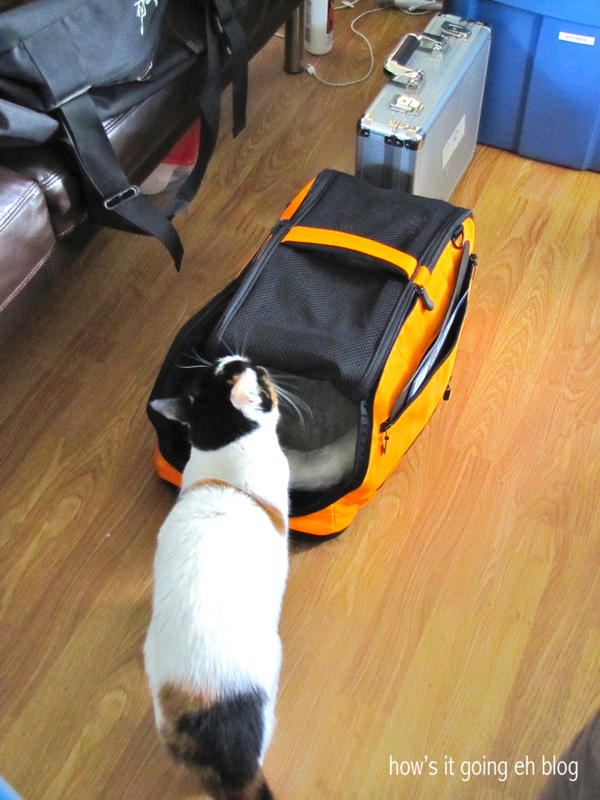 I set that out a couple days before we left so that Megumi could sniff at it + become familiar with it again. I monitored her food. Took away her food + water after around 10pm. And in the morning gave her a little bit to eat + drink at least 3 hours before departure – no barfy times, please. 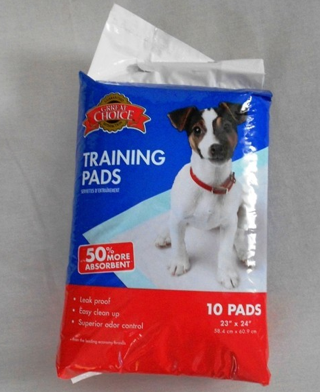 In case of any unpleasant accidents I lined her carrier with training pads + brought a bunch of large Ziplocs + Wet Ones. I placed her comfy bed inside the carrier. And I also took her towel that she sleeps on + draped it across the back of the car seat so at least there would be a familiar scent in the car. 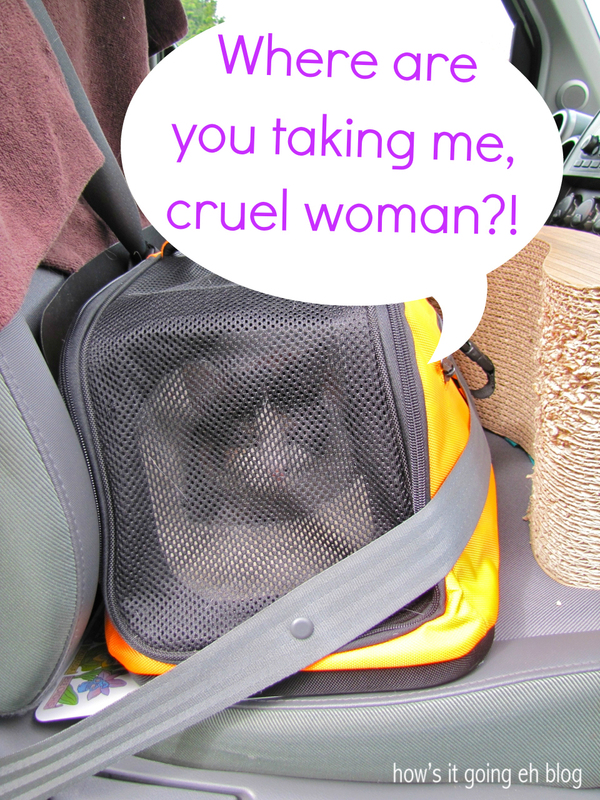 After I wrangled that crazy lady into her carrier + put her in the passenger seat she was NOT happy! The Sleepypod is pretty posh + has little strappy things for the seatbelt. 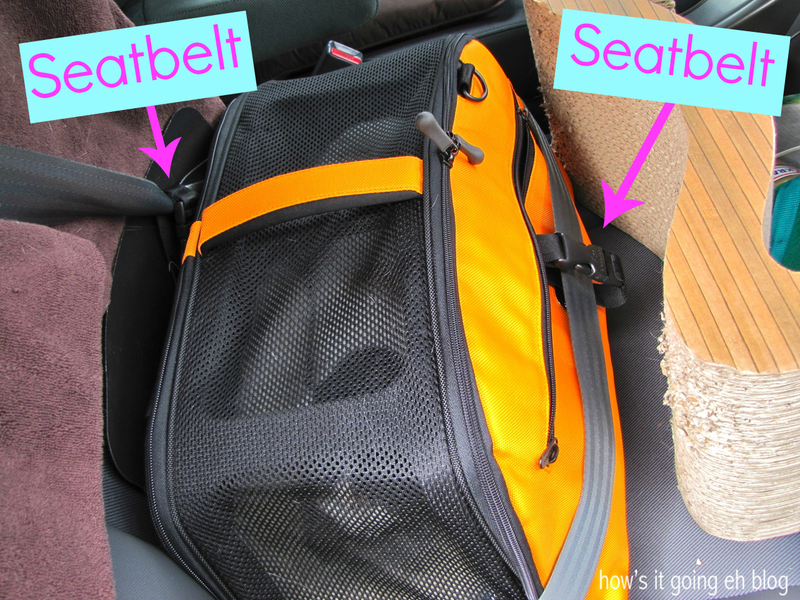 Alright, if you don’t have fancy seatbelt thingys on your carrier, make a fort of towels/blankets in between the carrier + the dashboard so your poor feline isn’t like ping-ponging around the front seat. Okay now this is the thing. 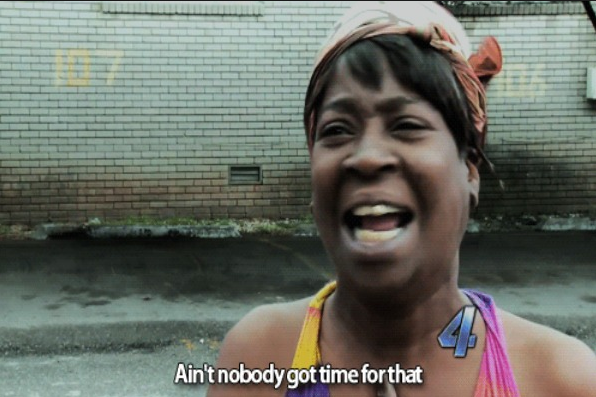 Yeah you’re going to be driving for a long time + it’s boring, but try + keep the music down REALLY LOW. No shrieking, no Swedish Death Metal, no screaming at other drivers + waving your fist at them, as you may be wont to do. Every once in a while I would talk to Megu in soooothing tones. 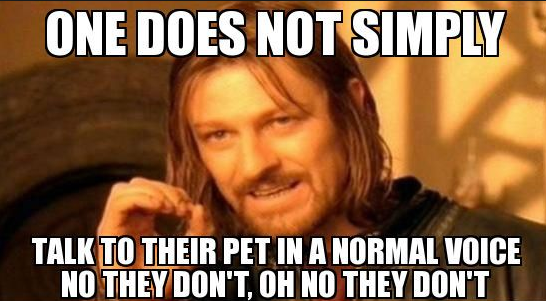 Also, realize that your cat is trapped in a little carrier + is filled with anxiety – she/he will get hot! You may be comfortable, but the cat most likely is not! Keep them cool by slightly opening the window, or turning a little air on them. I put a clean litter box behind her car seat (sounds gross I know, but what are you going to do?) 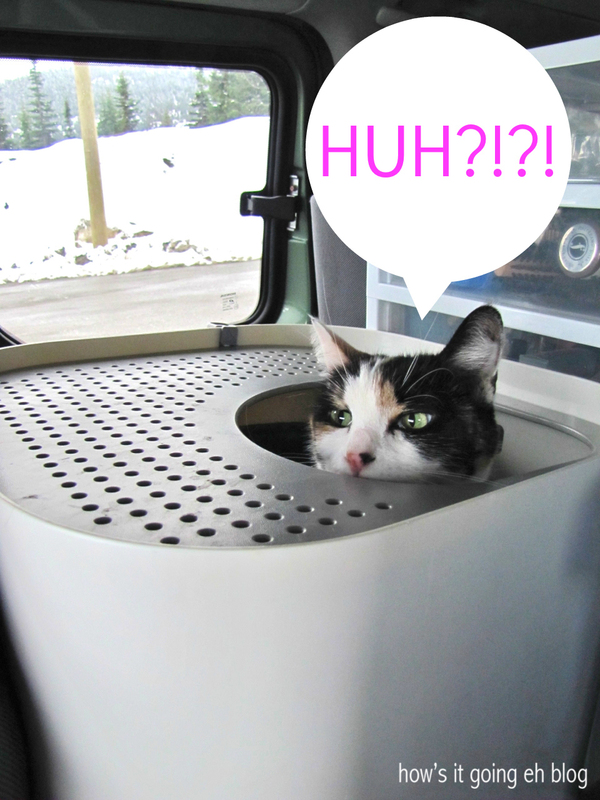 + when we took breaks to stretch our legs, I took Megumi out of her carrier + plopped her into the litter box for a go at it. Omigod, all the foreign surroundings + noises were too distracting for her! She just kept popping her head up + down like a little Jack in the Box! Hey, at least we tried – that’s all that matters! But each time we humans took a break – we gave Megu a break + took her out of the carrier. She’s so good, sometimes she would just sit there + just be happy enough to have the carrier open! I attempted at giving her some water + food throughout the trip, but Megu rejected it all! Too much nerves, I’m sure. But she ate like a champ when we got to our destination! All in all, road trip with cat success!!! Hopefully some of these tips help! 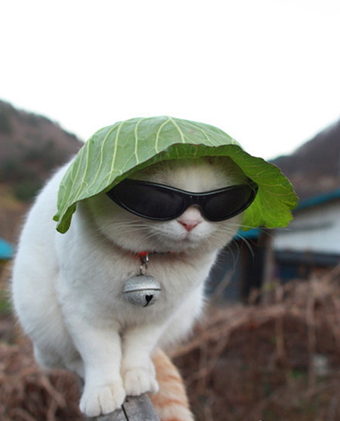 Oh, by the way, the best website I found about traveling with cats is Ramblin’ Cat. These folks have traveled with their cat all over the world!!!! Ta ta for now, have a great weekend everyone! ← Target (Finally) Arrives in Canada! She really is a trooper! Such a well behaved little miss! Megumi is very good cat. When Ashley and I took her to Vancouver I think she did not eat or drink at least 12hours . Besides she did soiled her cage for that long. It was amazing discovery for that! Love all photos of Megumi which it means blessed one in Japanese. I don’t know who is more blessed one Megumi or Shelli by now. You mean she DIDN’T soil her cage! You’ve been in Japan for too long, Mom! Your engrish is getting worse! Love you! Megumi rocks. I want to give her mooshy kitty hugs. She is a little peach!!! She is a pretty well behaved cat! And a posh one at that!!! What’s your new knitting project??? Vancouver, We’re Baaaack | how's it going, eh?